Anyway, I was following the letter of my law, not the spirit of my law. And then Saturday wasn’t much better. My husband’s parents came over for dinner at their favorite greasy hamburger place across the street from our house. I opted for grilled cheese and fries. I hardly ate any of the fries -and in my defense, the only salads they have are with iceberg lettuce, or tuna and mayo. So, today, I am determined to change the course of my Lent. My husband and I started the day with a 45 minute drive to the closest Trader Joes. It is a very small Trader Joes, and I found a few items that I had seen on blogs and wanted to try – namely honey sesame coated almonds – but wasn’t convinced that it was worth the 45 minute drive. There is a Whole Foods that is 50 minutes away that I absolutely love, so next time, I will probably go there. 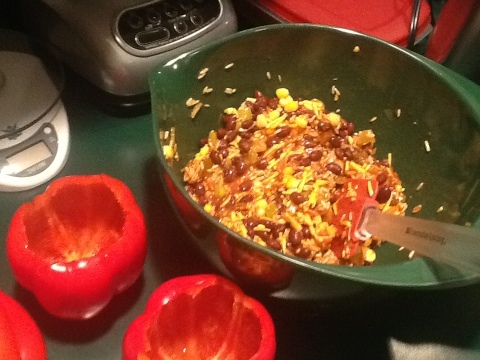 Here is the recipe I am using for Vegetarian Stuffed Peppers. I changed the recipe a bit just because I didn’t have the exact ingredients. I used a combination of sharp and regular cheddar cheese. I used brown rice instead of wild rice. (This is the change I think I am going to regret.) 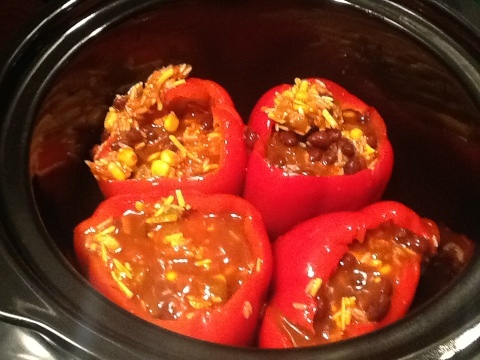 And I poured some red enchilada sauce over the top of them after I got them in the crockpot. And this is from a man who has only once before told me he didn’t like what I made, and when he did it was very tactfully done. So, that gives you an idea of how gross this recipe was. I can’t even talk about it. It’s the Voldemort of recipes. It shall not be named. Anyway – here are the before pictures. did the voldemort of recipes include gray steak? Yuk. I have not used the George Foreman since. I actually forgot about it until you just mentioned it. I might have to pull it out to make some paninis! !